I wound up making only one portion. Or at least one me-sized portion. I do so love a good salad. Honestly I intended to make enough for me and my hubs for lunch (I am working from home until January), but I was having real problems getting this grated. First, it looks like I must have lost the stem for my grating attachment for my cuisinart, so I took the whole thing out just to have it put it back. Then I was going to just use my box grater, when I was entranced by David’s tales of long curly carrots. I thought, “Ah! I should use my julienne attachment on my mandolin!”, so I used that but my guard kept me from using the whole carrot. I gave up after I had enough for one me-sized serving because I would have had to take PTO for the rest of the day just to get the rest of 1 lb grated. I liked this salad. I liked the sweetness of the carrots against the lemony vinaigrette. What I really liked was the mouthfeel of the julienned carrots, and the way that it felt when I chewed them. I know that sounds weird, but they were not entirely firm, a little bit soft, with a great bite. And it was surprisingly filling. I would probably make this again… it would go well with roast chicken or grilled meat of any kind. If you would like to make this for yourself, you can find the recipe here on Food52. It tells you to add an avocado which the book does not call for, but it is otherwise the same. This entry was posted in My Paris Kitchen | David Lebovitz, Sides and tagged Eat Your Veggies, Salad. Bookmark the permalink. 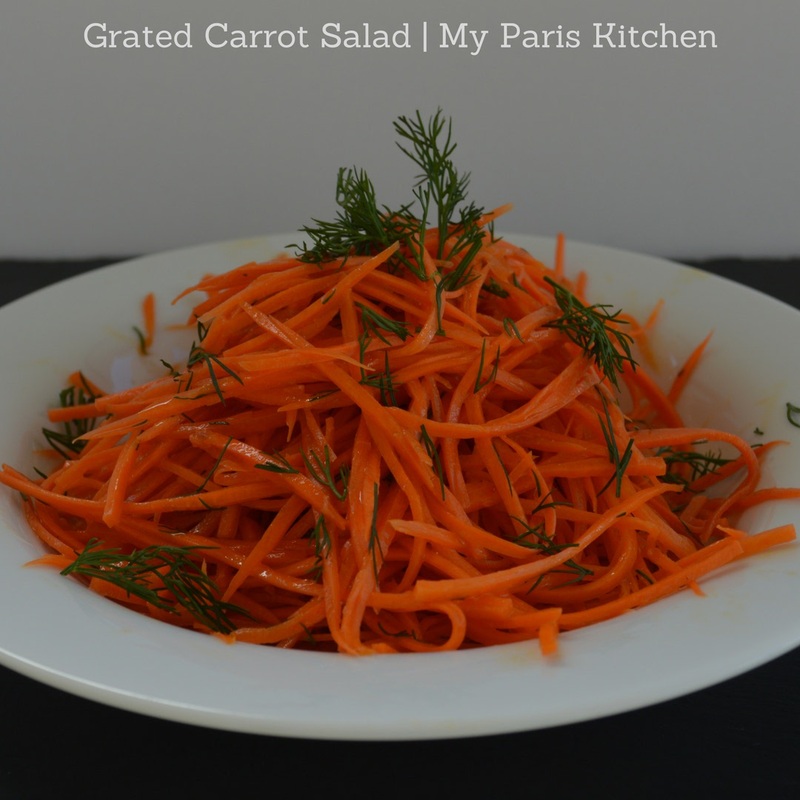 Oh yes, the sweet carrots goes perfectly with the lemony vinaigrette! We enjoyed this salad too and it makes a very nice side dish! I would like to try the juilienned method the next time! and this was really tasty. Reminds me of a coleslaw type salad. I’m glad you enjoyed your “me size serving” because your process was torturous! My processor with its attachment made life easy for me. It’s the first time I’ve ever used the grating attachment and I got the processor years and years ago. I found the stem for my grater attachment tonight, so now i feel that making this again will be a sinch! Mandolines are great, and generall help to make quick work of more laborious knife tasks. Nice looking carrot shreds. I thought you used a spiralizer before you revealed it was a mandoline. Like the sound of your me-sized-portion! Looks good too! I am afraid of mandolines… still searching for a safe-for-clumsy-people version! I made this salad twice already (I prefer it freshly grated! ), so easy to put together in its simple form, helps if you have the dressing ready to go in the fridge. I agree! I have an oxo mandoline, which I have found to be pretty safe. My only complaint is that it can be confusing to reassemble if you dissemble it to put in the wash. Otherwise I have been pretty satisfied with it. I identify with the missing the spindle for the food processor. I “lost” mine in the move, ordered a new one, and found the old one the same day the new one arrived. oh well. Your me-sized portion looks fabulous and I bet the texture was great! Love the dill garnish, too. Enjoy working from home!